About a month ago, there was a huge nuptial flight with many species. 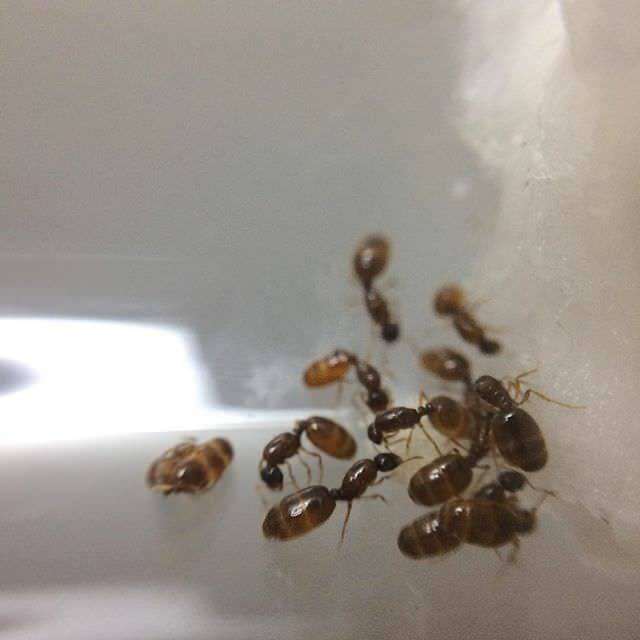 I managed to catch 13 Solenopsis Molesta queens and turns out they're polygynous. I decided to leave a honey-soaked cotton ball during this entire process, and it seemed to speed things up. It took them about 3 days to lay their first batch of eggs, but it was worth it. They laid a huge batch of eggs. I'd estimate around 40 - 60. They all hatched after about a week and stayed in the larvae stage for an additional 2. Unfortunately, they killed the weakest queen and fed it to their larvae. - The nanitics are TINY. The queens are only a couple mm's long, but the workers..! They're the size of the queen's antenna haha. Anyway, any tips on this species would be appreciated. Thanks for reading. OMG This Accedintuly Helped Me!I HAVE A S.MOLESTA COLONY NOT A L.HUMILE THX!Here My Colony Of Them! Since my last update, about 20 workers have enclosed, and the colony only has around 20 larvae left. I fed them some almonds and honey and they've been eating so much. Such a big appetite for such small ants. I should've hibernated them by now, but they aren't showing any signs of slowing down. I've kept them at around 19 degrees (66.2 Fahrenheit) and they don't seem to mind. These colonies don't last very long. They normally live in/near homes so temperatures stay consistent over winter. I'm assuming since they grow so fast, they reach colony maturity quite fast, and the queens die off soon after their nuptial flight. The queens in this species are extremely small and fragile. Luckily, since their so polygonus, I'll just add in more queens next year. there really cool. keep us updated during there time. also over hibernation better start thinking of moving them into a formacarium. Umm My Workers All Died.The Queen Is Fine.Theres A Worker That Should Expose Tommorow.So..How Do I Get Them To Steal Brood?Also,Can I Use Brood From Solenopsis Invicta?